Sagittal FSE T2-weighted MR image (TR/TE, 4000/110 ms) scanned 30 minutes after ozone (10 mL, 90 μg/mL) injection into the subarachnoid space shows gas (white arrowheads) in the subarachnoid space. There are no signal intensity changes in the spinal cord. Sagittal FSE T1-weighted contrast-enhanced MR image (TR/TE, 500/15 ms) scanned 1 week after ozone (10 mL, 90 μg/mL) injection into the subarachnoid space shows gas absorbed in the subarachnoid space. There is no abnormal enhancement in the spinal cord, dural sac, arachnoid, or nerve roots (white straight arrow) during the arterial phase. Aorta enhancement also can be seen (white curved arrow). Animals were sacrificed 1 week after ozone (10 mL, 90 μg/mL) injection into the subarachnoid space, and the spinal cord was obtained. The appearance of the spinal cords is normal. There is no discoloring or tarnishing, and the vessel is vivid and visible. 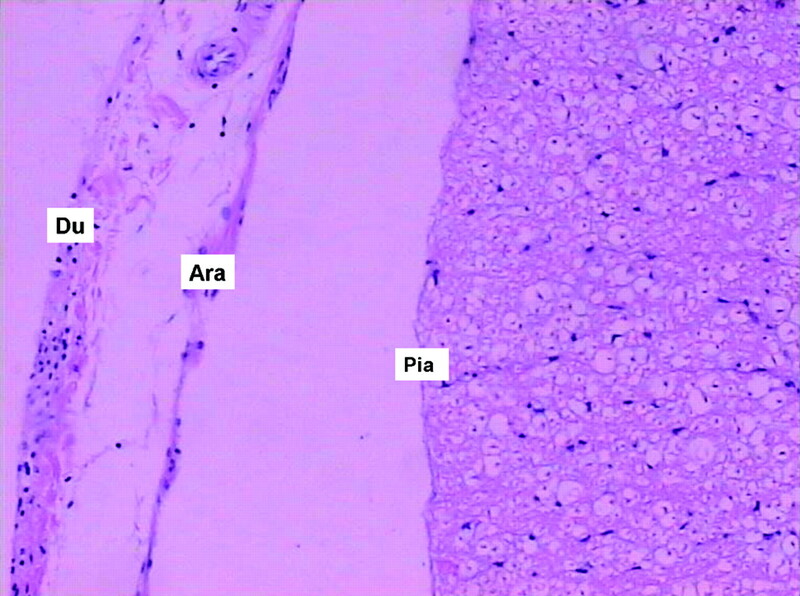 Histologic sample from the spinal cord in the lumbar 5–6 level 1 week after injection shows no abnormal changes in the dura (Du), arachnoid (Ara), pia mater (Pia), nerve tracts, or nerve roots (H&E, original magnification, ×40). Note:—There were no statistically significant differences among the values of composition at various times (P> .05). * indicates geometric mean ± SD; WBC, white blood cell count.